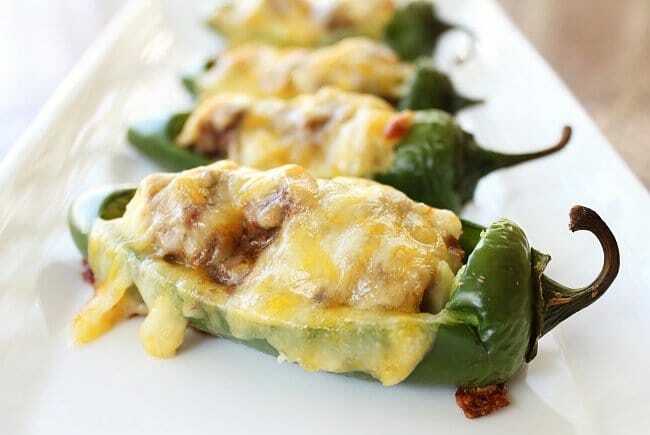 Home » Recipes » Starters » Appetizers » Cheesy Stuffed Jalapeno Peppers – Lets bring the heat! 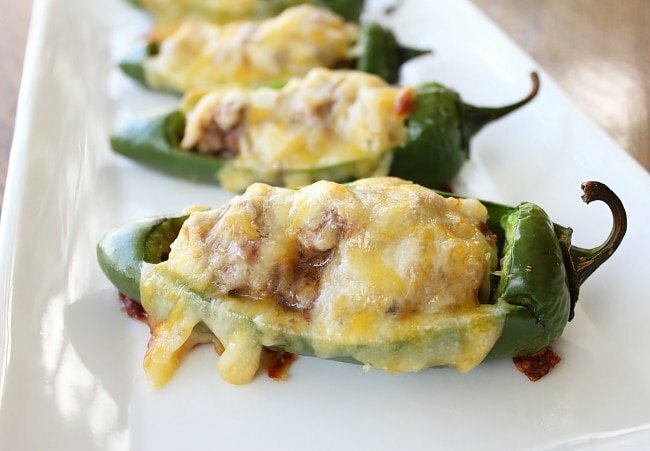 Fresh from the garden Jalapeno peppers stuffed with beef and cheese, served piping hot for an unbeatable snack or appetizer! 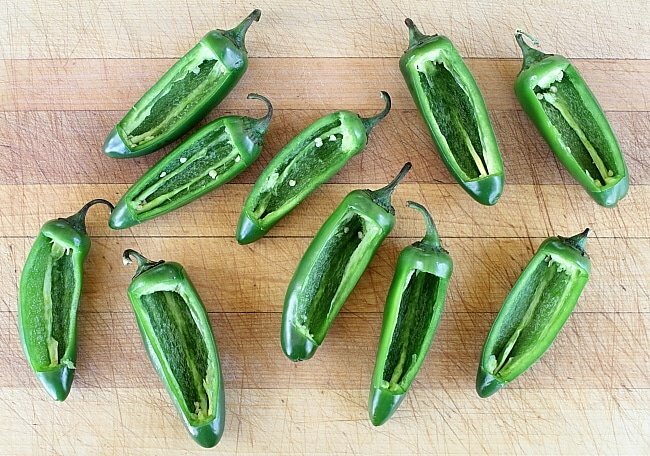 How to make Stuffed Jalapenos Peppers, because some days you need to bring the heat! It’s chile season in the southwest so we’ve got chiles popping out of our ears and I never stop looking for new ways to make a chile sing. 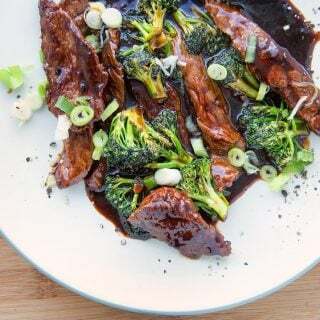 This dish was a special request from a picky eater who likes to bring the heat. I needed to come up with something that would get him to the table as painlessly as possible, so I came up with these stuffed chiles. The thing about chiles is that they aren’t all about heat. And, in fact, I remove the seeds and membranes, which is where most of a chiles’ heat comes from, whenever I make this dish. Chiles actually have a lovely, distinct flavor that pairs perfectly with so many other foods. And stuffed chiles is an infinitely diverse dish – you can stuff just about anything into these little gems and the flavor will just blow your mind. I went with well-seasoned sirloin topped with creamy cheese. After just a few minutes in the oven, we were feasting on stuffed chile heaven. Remove the panel of skin and scoop out the inside of each chile. Before you begin carving, I recommend that you rest the chile on its side to see how the fruit naturally falls – this will ensure that your chiles ‘stand up’ on your baking sheet and aren’t falling over and spilling out their filling as they bake. Place your carved chiles on a parchment-lined baking sheet and set aside. Meanwhile, in a medium bowl, place your ground meat, lime juice, diced onion and seasoning. Use clean hands to combine the ingredients, taking care not to over-work the meat so that it doesn’t become tough. Spoon the filling into the chiles, pressing into place so that each chile is liberally stuffed. Sprinkle the cheese over the tops of the chiles (you may need to press it into place on top of the meat, just to make sure that it stays in place). Bake your stuffed chiles for 12-15 minutes. 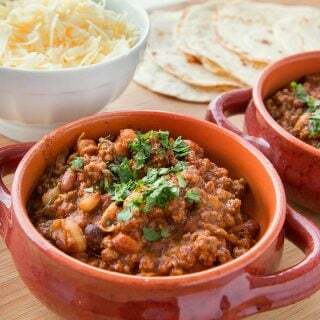 Baking times will vary depending on how large your chiles are and how well you have stuffed them – you are just trying to make sure that the meat is cooked through and your cheese is melted. Remove baked chiles and serve immediately. So yummy! I love southwest flavor. Well done. These would be perfect for a football day!! OMG! I could eat everything on that plate. Looks delicious! I will put this on my list to try. Oh yes another fine guest post! I’ll take 2 please! This looks so good…I’m totally craving this now. 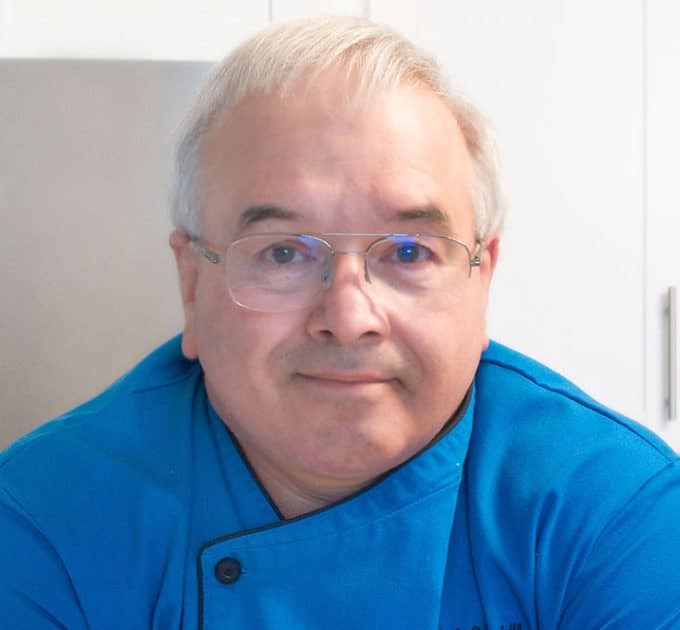 Thanks for the guest blog, Chef Dennis! The chilis look great, and I love the concept of a community of food bloggers. So many great recipes, so little time. Now I have too say, being Texan thru and thru, this recipe from Scarletta Bakes has gotten my attention. I adore beautiful, fresh jalapeno peppers or poblano peppers when I’m in the mood for a little spice. And Meghan knows the secret of scraping out the seeds and ribs if there are any. What flavor and a delightful surprise when you pop a bite into your mouth! Not hot! Just delicious! Muy Bueno Meghan and Chef! I’ve made lots of stuffed peppers in my day, but never a stuffed jalapeno. It’s the perfect time of year for a nice spicy little bite though. Oh my…I need these. Like, now. I could eat about 12 dozen of those in one sitting. They look simply scrumptious! Oh wow! That looks amazing! I want to have a get together just so I can make these…I wonder if my friends like spicy food?? Honestly, now I wish I had planted more than ONE jalapeño plant! These looks simply wonderful. I’m going to bookmark this recipe for my next dinner party! My husband and I have been exploring the world of stuffed peppers. These look amazing! Nice work. Great post. You had me at jalapeno! Great minds, right?! I posted my recipe for tuna stuffed peppers, much more “tame”. I used green bells. But I do love your photos. They look so cheesy and scrumptious. Delish! TGIF, indeed – especially for your guest posts! Another super guest with Meagan’s hot stuffed peppers. They’re dynamite! I’m a HUGE fan of Scarletta Bakes. I don’t think there’s a single post I haven’t read, honestly. This is soo perfect for us! Thanks Meagan! This would go perfect with my coffee right now. What a perfect tailgating treat! I love Scarletta Bakes – so witty and always something delicious! 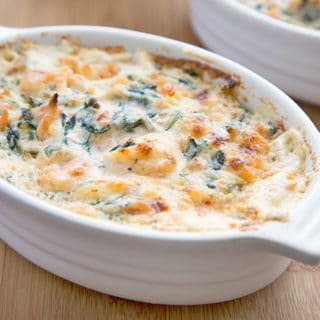 Wonderful recipe, I was just visiting Meagan’s blog, she has lots of great recipes. Thank you as always for sharing wonderful blogs. Delighted to see Meagan visiting A Culinary Journey. I love her writing, her wit and her food. 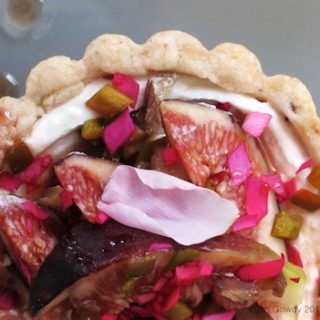 Megan does have a nice blog with a great variety of delicious food. These stuffed peppers sure look like a winner- this post has me craving them. Have a great weekend you two. Great choice for a guest post. I love Scarletta Bakes, and these peppers look amazing! Happy Friday! Great guest post. These look so amazing. I think I could eat a whole tray of them all by myself. So nice to see two great people on one blog. Hope you both have a fabulous weekend. Holy Guacamole! Those look unbelievably good! My hubby was reading this over my shoulder and kept give me that “you’ve gotta make these” nudge! I suspect he’ll keep nudging me until I pull them from the oven! These remind me of the jalapeno poppers, but so much healthier – baked, not fried. 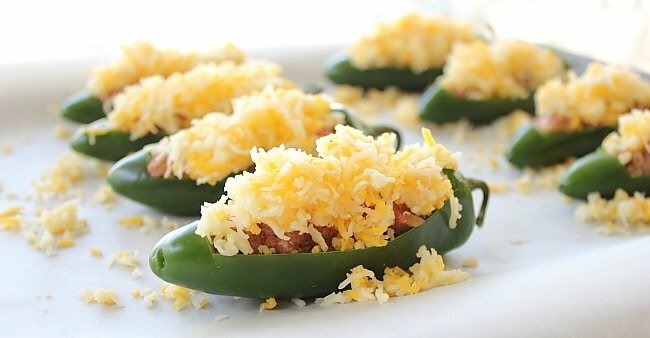 I’d like a whole plate full, stuffed jalapenos are my favorite! These look great! Though I’ve followed Megan/Scarletta Bakes on Foodbuzz I did not get the Southwestern focus until reading about it today. I will admit it to be one of my favorite genres of food; never met a SW dish I did not like. Megan so nice to learn more about you and Dennis another great, delicious kick off to the weekend; thank you! 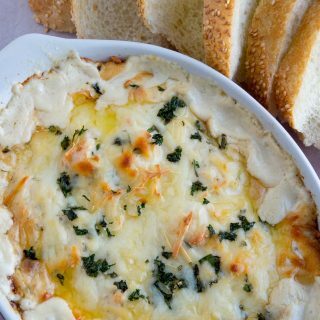 Cheesy goodness! These would be a great appetizer for a party. Thanks, Meagan! These peppers look fantastic! 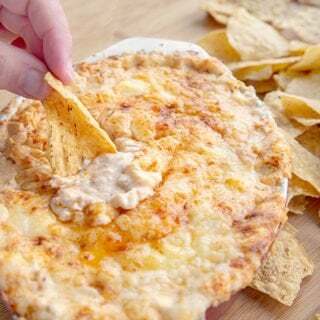 I love that cheese on top! And GREAT guest post! I really love Meagan’s blog! Wow beautiful peppers and a wonderful guest post!! Awesome dish and beautiful photos! This is my new love – stuffed peppers. And oozing cheese seals the deal!